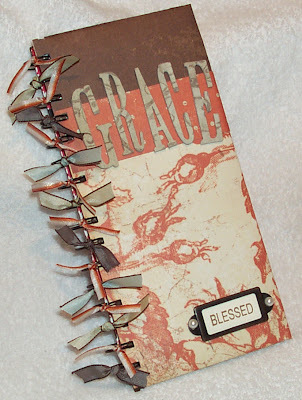 "The word grace is a kind of shorthand for the whole sum of unmerited blessings, which come to men through Jesus Christ. Primarily, it describes what we, for want of a better expression, have to call a "disposition" in the Divine nature; and it means the unconditioned, undeserved, spontaneous, eternal, stooping, pardoning love of God." Amen and Amen! Surely, God's free gift of grace can cause us to sing His praises each and every day! We pray that our challenges are a blessing to you and ask that if you'd like to create a "Grace" themed project to leave a comment on the SALT blog, with a link back to your gallery or blog, so that we might share and rejoice with you! Enjoy and Happy, Blessed Creating!! I created a few thank you cards using justjohnna images a few weeks ago and am finally getting around to posting them...here's the first. The "thankful, grateful" saying was released in the Fall of last year and I loved it from the moment I saw it! We say thankful a lot but I love the added touch of letting someone know that you're grateful. Grateful seems to be more weighty, doesn't it? I paired the sentiment with some of Stampin' Up! 's newest double-sided patterned paper. The large flower was actually cut out from the paper...isn't it lovely? The colors are so vibrant on these papers. I'm not typically a "bright" color person but the shades of orange, red, and blue are beautiful together. I'm loving it! For the card I simply cut a few strips of patterned paper to run across the middle of my card, adding a scalloped border, lined with orange eyelets, to finish the belly band. (The scallop was created with a Stampin' Up! slit punch) The flower was then cut out and mounted onto the band, adding just a hint of diamonds Stickles to portions of the flower for a little extra pop. I rounded the bottom corners of my card and added that big 'ol thankful phrase to complete the look! Sorry I've been "missing in action" lately! Things have been hectic and I'm afraid I haven't had time to do much stamping. Tonight's post is also going to be a quick one too because I am actually working on some projects that I need to finish up tonight. I will have a few new items to share later in the week, specifically my creation for this week's SALT challenge, which I had the pleasure of throwing out to the team, so be sure to check back for that project! This is a card I made back in October for a friend's wedding anniversary....Super quick card that I made the evening before I was going to give her the card! Perfect card for her because her favorite colors are earth tones. All supplies are Stampin' Up! with the exception of that lovely brown velvet flower and yellow flowers (the yellow is actually a white flower that I sponged yellow), which is compliments of Maya Road, purchased from Papertreyink. Enjoy and check back later this week for more new projects!! Lime Tart Sketch and an Exciting PS! I'm running a bit behind with this post as the cards are already up on the Lime Tart blog but here are my contributions to the January sketch challenge. You can check out all the other designs here. I received word last night that a card I submitted is going to be published in the Cards Magazine in June! This is the first time one of my creations will be published - well...it's the first time I've ever submitted something so I was super shocked that it was picked - and I am so excited! Once the magazine has been published I'll be able to post my card on the blog to share with everyone. Thank you to everyone out there who daily serves as an inspiration to me. There's no doubt that I have learned so much from reading what is shared online from the most generous community of stampers! You guys rock! "On the Salt we have been very encouraged by your comments and by the wonderful creations that you have shown us as, together, we have combined our faith and our love of crafting. I love that verse in 1 Thessalonians 5:11: 'Therefore encourage one another and build each other up, just as in fact you are doing.' - in fact, there is so much about encouragement in those letters, and indeed, in other letters from Paul. Encouragement is such a blessing to receive and also to give." For this challenge I thought that a card would be a good option as a card is a wonderful way to send a word of encouragement to another. The scripture verse that served as the foundation for my card is from Colossians 2:2, a portion of which is noted on the tag on my card. The entire section, Colossians 2:1-3, was photocopied from my Bible and adhered to the background of my card. Just reading this verse is encouraging as I think of my many dear Christian friends throughout the world and how we're "knit together in love" through Christ. There is a peace in knowing that friends will pray for you in times of trouble and that they will love you as their sister (or brother) and your hurts will be their hurts. This is a truly special gift that God grants to us and it is a blessing and comfort. We'd love to see your take on this challenge so please leave us a comment on the SALT blog when you are finished your piece, so that we and others may see your work. To get you inspired visit the team on the SALT blog who have come up with some beautiful pieces. Also, over the holidays I heard from a friend that I haven't talked to in a number of years, so I used some of my free time to create a card to send back to her. This also gave me a wonderful opportunity to play with my new Thickers! Who is a fan of American Crafts? I've heard of them but didn't know much about their products. They have all of these delightful sticker letters and numbers - love them!! I ended up with about six packs of foam, vinyl, and felt letters. The ones used on my card above are vinyl. 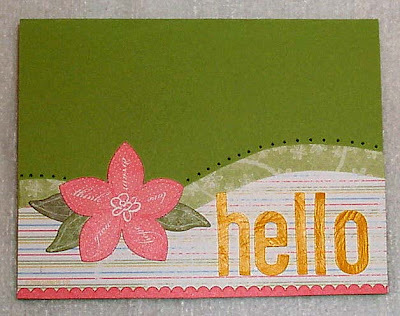 The paper, flower, leaves, and scalloped border are all part of a Stampin' Up! Scrappin' Kit. Everything, minus the paper, are stickers. What fun! I'm finding that I'm really enjoying creating a more simple lined card, with quick and easy layouts. 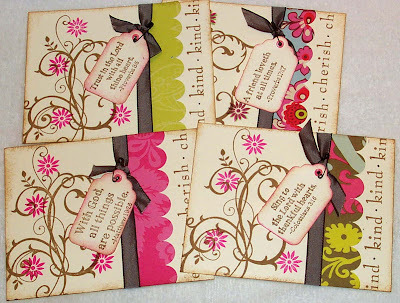 These types of cards are not only easy to create but are visually appealing. 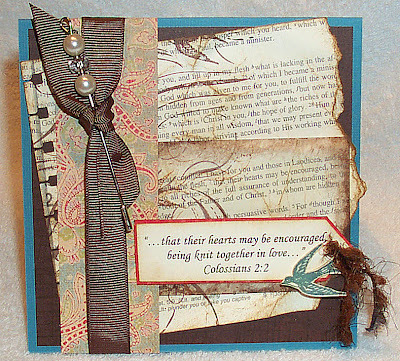 I'm thanking Kristina Werner (you can see her blog here) for inspiration on using Thickers and simple card layouts. She's got a great eye for design...well...that would be because she's a graphic designer! LOL! And she has really hip videos! Thanks Kristina! 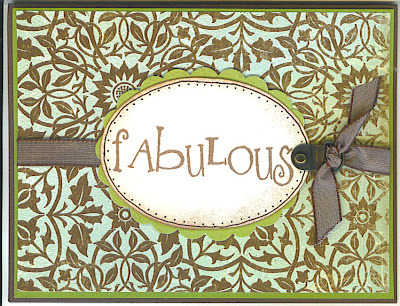 Anyone who knows me well knows I have a thing for saying "fabulous" about anything that is...well...fabulous! :-) So when I saw this justjohanna stamp I knew I had to have it! What's even more "fabulous" about this stamp is that it's full of a big 'ol font! Delightful! This first card is pretty straight forward...some Old Olive cardstock layered with some lovely Crate paper, add a scalloped oval (thanks to a Marvy punch) and a plain oval (thanks to Nestabilities) and you've got yourself a card! I did doodle a bit around the plain oval and of course added some ribbon...you can't live without ribbon on a card! This next card is even more....you guessed it...fabulous as not only is it sporting my favorite phrase but it's also sporting Al with some big 'ol hair. And anyone who knows me well knows I have big 'ol hair! Well it's not that big anymore but in the early 90's..it was big! 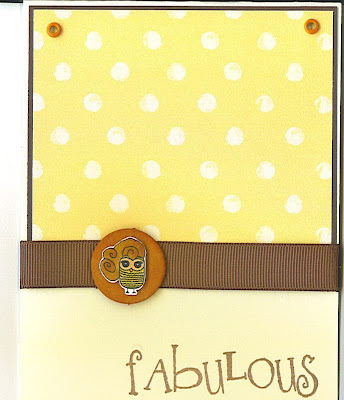 Another easy card...some cardstock, eyelets, and circle chipboard, with a wonderful phrase and a wonderful owl...oh, and some ribbon! Have a Big, Fabulous Day! On my last post you saw the justjohanna 'Swirly' background and here it is again! Only this time it's not a bleached image and you can see it in all it's glory! Isn't this the most yummy background stamp! It's so much fun that you don't even need to use any other images with it...it can stand alone! This is a great stamp to add to one's collection! The image was stamped on cream cardstock and the swirls and flowers were colored with Copic markers. The orange polka dot paper is by Crate (love their paper! 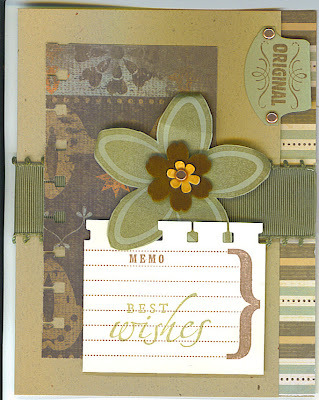 ), and the Sky Blue background cardstock is from Stampin' Up! I added a few crystal brads to anchor the background and a paper covered piece of chipboard, stamped with my sentiment, finished off my piece. This is such a simple card but it is one of my all time favorites! Enjoy! Taking part in the Wednesday Stamper challenge was a first for me...as was creating a gothic arch...but I don't think it will be my last time playing along! I love these arches and have been seeing them pop up on some friends blogs for awhile now. I'm glad I got an opportunity to create my very own arch for this week's challenge! I started with a dark brown card base. Using bleach, I stamped the swirly background stamp directly onto the brown cardstock. The bleach pooled a bit at the top of the card but that's part of the charm of using bleach and I prefer a more "natural" look on some of my designs, especially an arch that reminded me of an old ruin in some quaint part of Europe...While my bleach was air drying, I created a band of cream and used a border stamp and "thanks" sentiment to complete the band. I also created small dots in between each "thanks" using a VersaMark pen and gold embossing powder. After attaching the band I edged the entire card with the VM pen and more gold embossing powder. 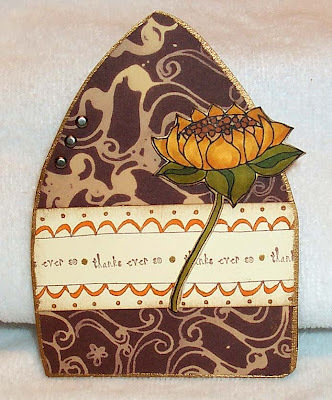 The flower was stamped, colored with Copics, cut out, and attached with dimensional tape to the card. The left side felt a bit blank so I added three aged brads to the top. All stamped images used in the creation of my arch are compliments of justjohanna! Happy New Year! May 2008 be a year of blessings and growth in the Lord for you! You know setting these challenges is quite a soul searching exercise. When I chose this theme the time of year came to mind the start of a New Year and so many of us make New Years Resolutions, we look at the New Year as a sign of change & a time to grow. In order to change & grow we must examine so this weeks challenge is perhaps a verse that may help you to examine. Please take inspiration from the Gospel of Matthew 6:21, "For where your treasure is, there your heart will also be." 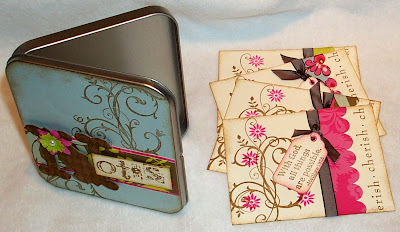 I ended up creating a note card holder and cards, which are housed in a thin tin holder and sporting four verses that I thought focused on a few "treasures" of God's goodness. The four notecards are identical except for the verses and scalloped paper accent. 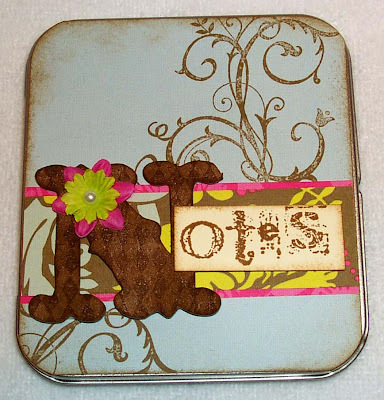 Paper is K&Company, stamp set and ribbon compliments of Stampin' Up!, and that fabulous giant "N" on the cover of the tin is Tim Holtz grungeboard...ever heard of it? It's new for me but boy is it amazing! It's a super tough material, soft, flexible and it holds up much better than chipboard. You can paint it, stamp on it, distress it - anything you want! You can check out grungeboard on Tim's site here. One of my other favs on this project, which might be tough to see, are the tiny safety pins holding my tags onto my ribbon. So fun! Oh and the flowers on the front are a white material (from Stampin' Up!) that can be colored any color you want! Super fun! We'd love for you to join in with us on this week's challenge. Once you've completed your piece, leave us a comment on the SALT blog and we'll come and view your creations!